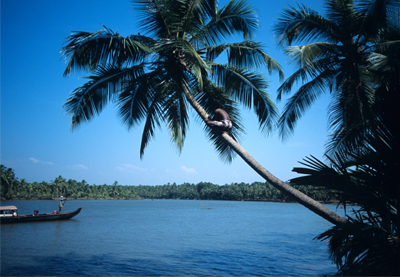 On the south-west coast of India lies one of the smallest states of the country – Kerala! 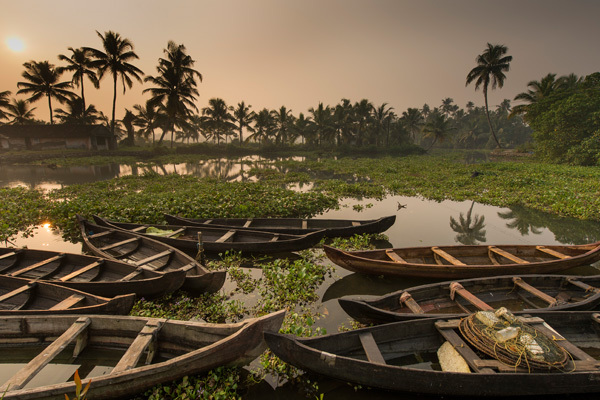 The revered land of Kerala is most renowned for its stunning backwaters. Though a priceless experience in itself, there’s far more to discover in what is famously touted as ‘God’s Own Country’. The spellbinding green lands of Kerala are only the perfect backdrop for the thriving mix of dynamic & vibrant cultures around its river banks. Some of the indigenous communities home to these lands are some of the oldest civilisations from this part of the world. The centuries old heritage and forms of folk-art, handicrafts & rituals could potentially make your Kerala holiday one of the most priceless experiences of your life. Kerala also enjoys the mild distinction of enjoying a special place in our hearts, since this is where our journey began several years ago. Our Kerala Holidays are some of the most innovative holidays in the experiential space. We are involved in several innovative community-based projects in multiple locations in rural & contemporary Kerala. This participation at the grass-root level has created a strong bond between the communities and our travellers. This in turn facilitates priceless local encounters that our travellers revere for years to come. 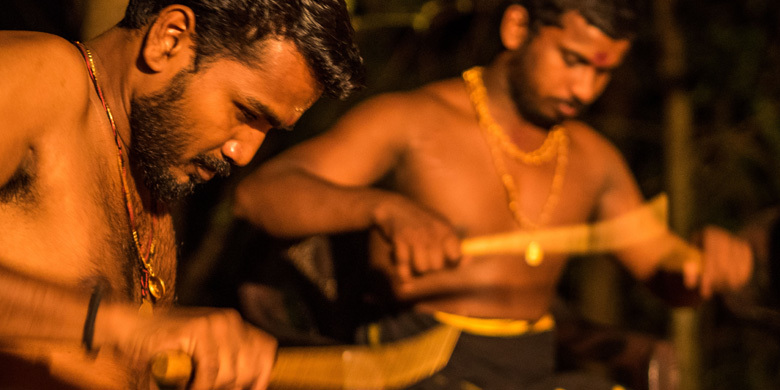 Join us as we discover some of the biggest treasures of this timeless land on one of our custom-made Kerala Holidays! The North of Kerala lies in the shadows of the Western Ghats. Our epic journey in the North begins on the banks of River Nila, where travelers will spend time in the local villages and engage in interactive sessions with their many artisan communities. This is followed by a few days of relaxation in Nilambur & Beypore before we rendezvous with the spice plantations and wildlife of Wayanad! This wonderful holiday focuses on acquainting travelers with the many traditional art forms & skilled professions of the Nila basin & finally ends with an enchanting beach-stay at Neelaswar. This journey starts at the scenic River Nila. After settling, we will take you on a leisurely cruise down the Nila on a Thoni (traditional boat). The cruise passes through stunning landscapes comprising small canals, rivers and backwaters of a relatively unknown area called Tirur. This trip goes through several small islands where various communities of toddy (coconot palm liquor) tappers, coir rope workers and fishing communities live. The boats used for the Thoni Cruise as well as the oarsmen are from the local communities. The cruise is an alternative, supplementary source of income for people who were otherwise engaged in disruptive activities such as illegal sand mining from the river-bed. Get your hands dirty learning pottery with local artisans, and watch them weave magic on clay. At the bell metal workshop witness the creation of intricate designs such as tea-pots and door locks, a craft confined to a few families in the region. The visit to the potter & bell metal community is an appreciation of the efforts to rehabilitate the traditional handicrafts in the area. Our visits expand the knowledge about the program and provide them financial support. During a magical evening, young folk artists will showcase the folk heritage of River Nila and you might easily find yourself singing & dancing along. Evening with the folk artists is part of a movement to revive the dying forms of folk art and music in the River Nila basin. Spend half of the day in interactive sessions with the masters of classical arts at Performing Arts School “Kalamandalam” and check into a rural farm stay for the evening. Spend time with a family of musicians. The musical trail is a journey to showcase the percussion culture of River Nila. A clinic on various kinds of musical instruments concludes with a performance extraordinaire by the talented group. After a simple homely lunch, we proceed to a home stay in Nilambur to relax and spend an evening discussing Kerala’s history, art and culture with the host. Spend a day relaxing at the homestay. 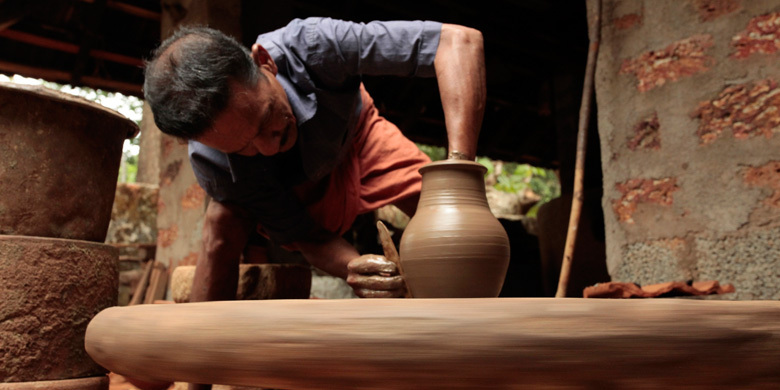 (Optional visits to the pottery making center or teak forest can be arranged). In the morning, move on to Beypore to visit an initiative set up to provide jobs for local weavers and preserve their rich traditional knowledge. The NGO gives opportunities for travelers to participate in the weaver’s workshops. From Beypore we drive up to Wayanad (two and a half hours) and check into a beautiful hill-side property. Visit of the Edakkal caves to see the pictorial remnants of civilisation dating back to 5,000 BC. The next day you will spend the morning at lush green spice plantations as part of the spice tour, visiting various farms owned by local communities. After lunch at a local home, we vist Meenmutty waterfalls, which are tucked into a rainforest and can be approached only by a two-hour trek. Moving on, we check into another cute farm stay in the north of Wayanad. In the evening we take you on a beautiful safari inside the Tholpetty wildlife sanctuary, which is a biodiversity hotspot. The safari is a chance to spot the Asian elephants, bears, wild gaurs (bison), spotted and sambar deers or even a leopard. Dedicated days of relaxation on a beautiful beach property. 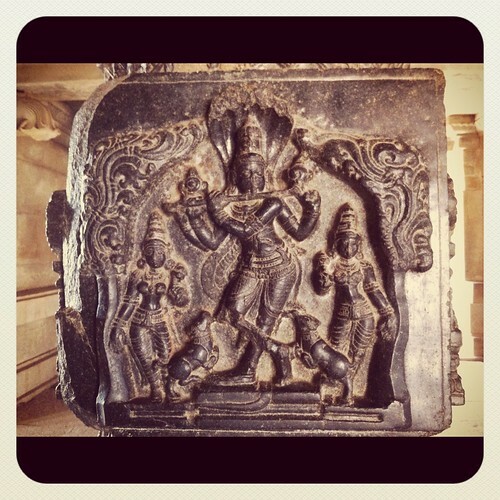 Optional activities & visits, such as to the Bekal Fort and some of the many temples of this region, can be arranged. Please note that the above is a sample itinerary for a 14 days trip to North Kerala. We design each trip according to your personal calendar, wishes & needs. The North of Kerala lies in the shadows of the Western Ghats. Our epic journey in the North begins on the banks of River Nila. The Malabar Holiday is designed to offer travelers a perfect balance between relaxation in scenic, secluded landscapes and ample opportunity to interact and witness the vibrant culture of Kerala. Experience the magic of Fort Kochin, the backwaters of Alleppey, the dynamic heritage of the River Nila basin and meet the traditional spice-planters of Wayanad on this custom-made holiday! Land at Cochin and check into a boutique hotel in the heritage quarter of the city. Check out Fort Cochin Jew town, synagogue, spice markets, the Dutch palace, St Francis Church and Chinese fishing nets. 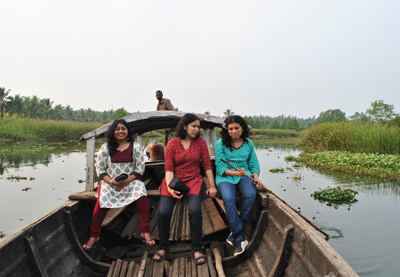 Drive down to relax in the idyllic backwaters at Alleppey. Go onboard a houseboat for an overnight cruise. The houseboats cruise through the backwaters of Kuttanad – the rice bowl of Kerala. The banks of the waters will be lined with lush paddy fields, fishing nets, coconut grooves, and local villages. Soak in a sunset and sunrise on the water while enjoying a relaxed dining experience. 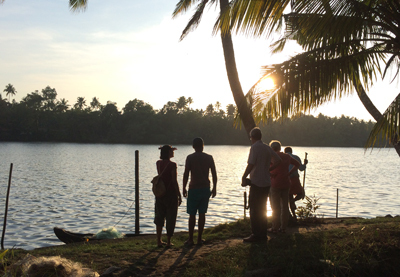 Disembark from the houseboat for a short transfer to Karimbavalavu – a secluded island on the backwaters. 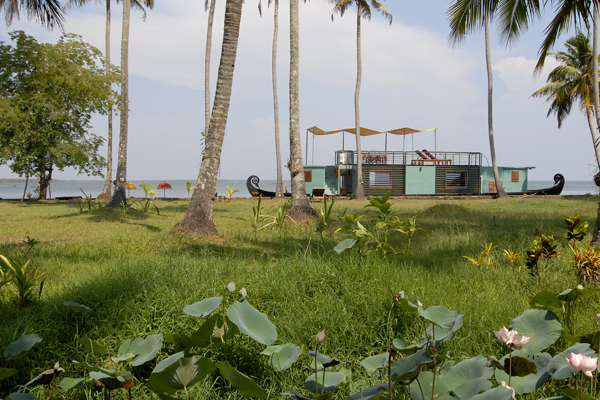 There are six cottages overlooking the backwaters with nothing but breathtaking views for company. Known for its bird life, the island is a great stopover for relaxation. Cycling, village visits, and small trips in canoes are included. Drive up direction north to the historic and scenic River Nila. 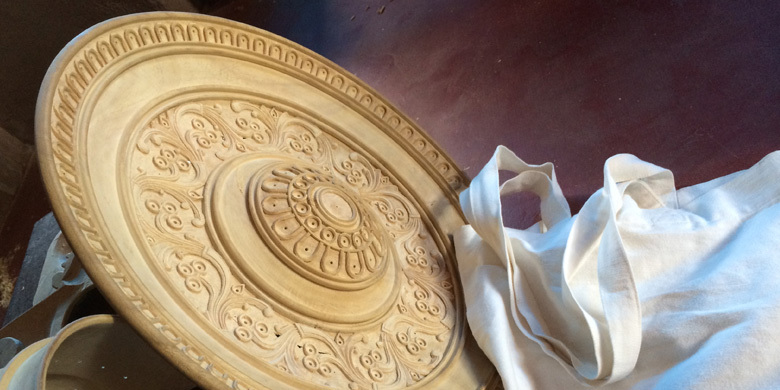 Get your hands dirty learning pottery with local artisans, and watch them weave magic on clay. 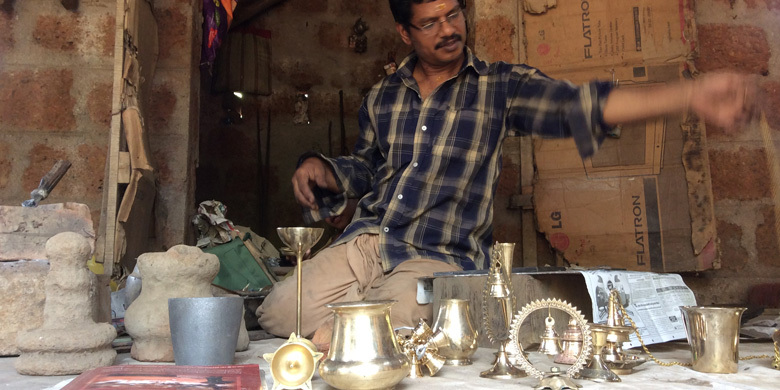 At the bell metal workshop witness the creation of intricate designs such as tea-pots and door locks, a craft confined to a few families in the region. The visit to the potter & bell metal community is an appreciation of the efforts to rehabilitate the traditional handicrafts in the area. Our visits expand the knowledge about the program and provide them financial support. During a magical evening, young folk artists will showcase the folk heritage of River Nila and you might easily find yourself singing & dancing along. Evening with the folk artists is part of a movement to revive the dying forms of folk art and music in the River Nila basin. Visit the beautiful 400-year-old heritage house Kooderi Mana, unique representative of sustainable life style. Stay with the family and experience a traditional rural Kerala ambience. In the midst of an organic farm, this heritage house is part of the responsible tourism initiative that is making positive changes to the destination. 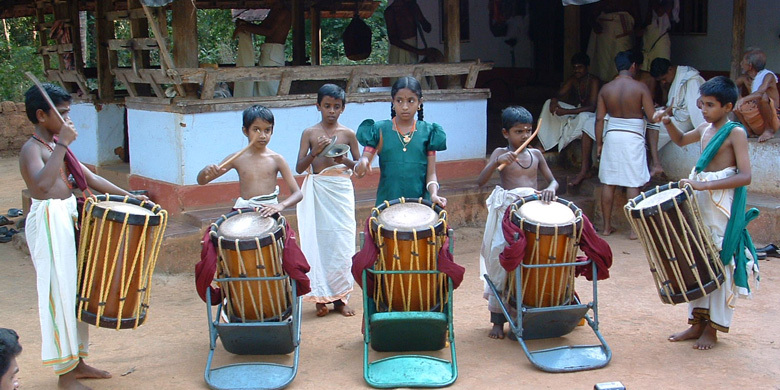 Spend time with a family of musicians in the village of Mulayankavu. The musical trail is a journey to showcase the percussion culture of River Nila. A clinic on various kinds of musical instruments concludes with a performance extraordinaire by the talented group. We will take you on a leisurely cruise down the Nila on a Thoni (traditional boat). The cruise passes through stunning landscape comprising small canals, rivers and backwaters of a relatively unknown area called Tirur. This trip goes through several small islands where various communities of toddy (coconot palm liquor) tappers, coir rope workers and fishing communities live. The boats used for the Thoni Cruise as well as the oarsmen are from the local communities. The cruise is an alternative, supplementary source of income for people who were otherwise engaged in disruptive activities such as illegal sand mining from the river-bed. 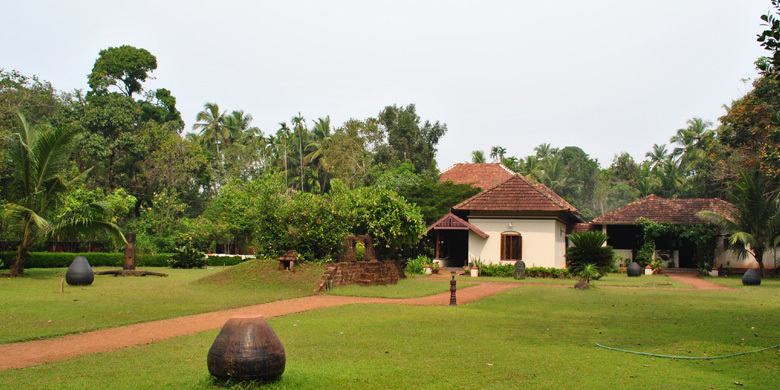 From Nila you will drive up to Nilambur (one hour) to check into Maranat Mana, a heritage property reflecting the age-old traditions of a Kerala Brahmin family. Focusing on sustainable living, this place strikes an excellent balance between traditional life style and modern living. The two-acre sacred grove inside the farm is a representation of a bio-diversity that is still sustained. Spend the day in the village or the majestic home stay. Activities (at no extra cost) include visits to farms and traditional bathing ghats. Home to several spices, Wayanad now has a viable and vibrant spice cultivation program. From cardamom to cinnamon, pepper to ginger and even vanilla, you can see for yourself the abundance of spice all along the hills of Wayanad. The idea of a spice tour was conceived as an alternative source of income for small scale farmers and planters in Wayanad. Spice tours are also arranged in such a way that it gives travelers a taste of living a planter’s life. Enjoy the adrenaline rush of a morning wildlife safari in Muthanga wildlife sanctuary, a biodiversity hotspot. The 24-kilometre safari is a chance to spot the Asian elephants, bears, wild gaurs (bison), spotted and sambar deers or even a leopard. Post-lunch we visit, Uravu, where you can interact with the artisans and designers who create beautiful products out of different varieties of bamboo which are grown locally. The visit also includes interactions with the promoters and a visit to the bamboo nursery. 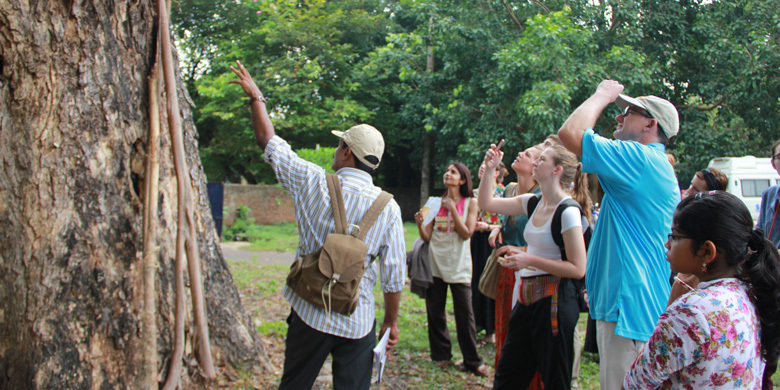 The visit to the rainforest garden involves interaction with the community who initiated the rainforest regeneration and the latter half of the visit benefits the community living in the alternative school campus. Trek guides are from the local communities and they operate all programs. These are people who live on the fringes of the wildlife areas. All parts of our trek routes and campsites follow zero waste management. During and after every trek, we collect and dispose plastic waste that might have been left behind by other tourists and local people. The costal town & area around Kannur is home to the most idyllic beaches in the Malabar region. If desired, travelers can embark upon a boat voyage to nearby towns, far from the crowds. 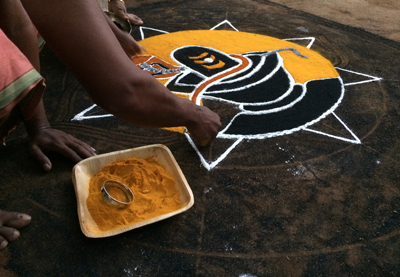 Many traditional folk art forms can be witnessed in villages surrounding Kannur. Here you might want to relax on the beach near Kannur, or visit St Angelo Fort, Arakkal museum and the Cannanore Lighthouse. 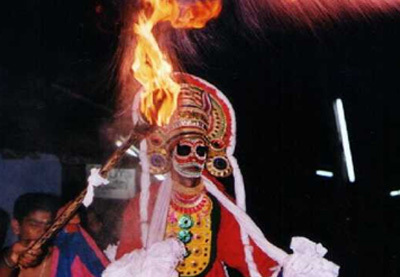 We can also take you to temples nearby for Theyyam performances. Please note that the above is a sample itinerary for a 12 -14 days trip to Kerala. 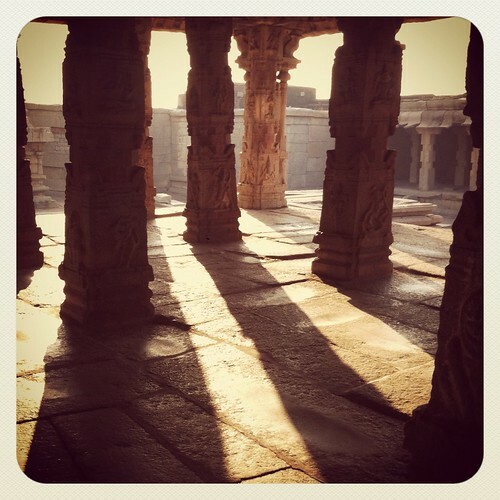 We design each trip according to your personal calendar, wishes & needs. The Malabar Holiday is designed to offer travelers a perfect balance between relaxation in scenic, secluded landscapes and ample opportunity to interact and witness the vibrant culture of Kerala. The Classic Kerala Tour is a classic for a reason – it covers most of Kerala’s limitless magic, without rushing through its many wonders. Begin at the wonderful coastal city of Calicut before visiting the spice planters of Wayanad. Spend time interacting with the many communities along River Nila, followed by an outdoorsy few days in the Chimmony Wildlife Sanctuary. Explore the wonder of Fort Kochin and call on the Royal Bengal Tiger in the Periyar Reserve! Finally, conclude your visit to God’s Own Country in the scintillating backwaters of Kumarakom! In the North you will visit the beautiful coastal city of Calicut and travel to Wayanad by road (3 hours) with one of our storytellers. 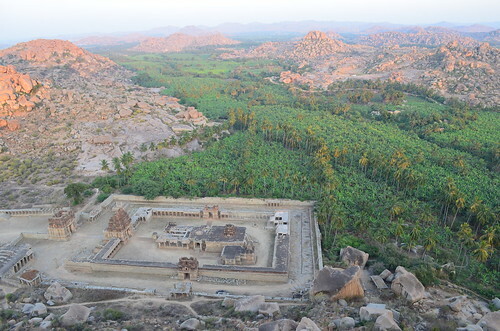 On the way you might want to visit Edakkal caves and its pictorial remnants of civilisation dating back to 5,000 BC. Enjoy the adrenaline rush of a wildlife safari in Muthanga wildlife sanctuary, a biodiversity hotspot in Wayanad. The 24-kilometre safari is a chance to spot the Asian elephants, bears, wild gaurs (bison), spotted and sambar deers or even a leopard. After a lunch in a local home, we take you on a Spice Tour, tea trail and finally cool off at a waterfall in the middle of a rainforest. Traditionally, Kerala is a major exporter of spice. Several communities have been engaged in the cultivation & plantation of spices since centuries. The Spice tours were started with the objective to support small farmers and spice planters in and around Wayanad as an alternative, supplementary source of income. The tour provides a glimpse into the lives with special focus on the struggles of spice farmers against fluctuating prices and globalisation. Take a leisurely cruise down the historic and scenic river Nila on a Thoni (traditional boat), and end the day with a visit to Thunjan Parambu Literature Park and Vakkad beach on the banks of the river. The boats used for the Thoni Cruise as well as the oarsmen are from the local communities. The cruise is an alternative, supplementary source of income for people who were otherwise engaged in disruptive activities such as illegal sand mining from the river-bed. 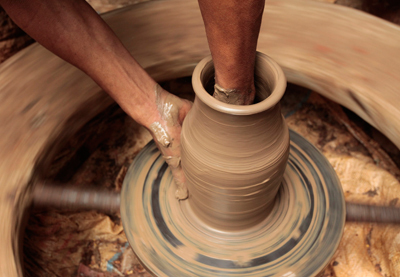 Get your hands dirty learning pottery with local artisans, and watch them weave magic on clay. At the bell metal workshop witness the creation of intricate designs such as tea-pots and door locks, a craft confined to a few families in the region. The visit to the potter & bell metal community is an appreciation of the efforts to rehabilitate the traditional handicrafts in the area. Our visits expand the knowledge about the program and provide them financial support. During a magical evening, young folk artists will showcase the folk heritage of River Nila and you might easily find yourself singing & dancing along. Evening with the folk artists is part of a movement to revive the dying forms of folk art and music in the River Nila basin. Spend half of the day in interactive sessions with the masters of classical arts at Performing Arts School Kalamandalam . Our naturalist will lead you on a light trek through the wilderness of this beautiful sanctuary, which is comprised of tropical evergreen and deciduous forests. You might even want to choose to end this day camping under the starlit sky by the rainforest and rise for and early session of bird-watching. Fort Cochin is a fabled melting pot of culture, and you find this reflected in every corner of the city. Accompanied by a local storyteller, you will visit Jew town, the synagogue, the spice market, Dutch palace, St Francis Church and the Chinese fishing nets & lively promenade - a heritage walk that gives you a peek into the still-very-present past, as well as the vibrant local texture of today. 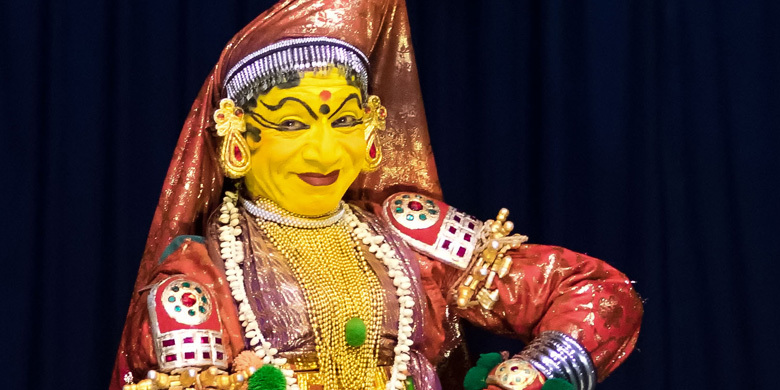 Attend a rendition of the world-renowned Kathakali dance performance in the evening at a theatre in Fort Cochin. This wildlife reserve is the home of the regal Royal Bengal Tiger. The visit begins with a light three-hour night trek to explore the wonders of life in the jungle after dusk. 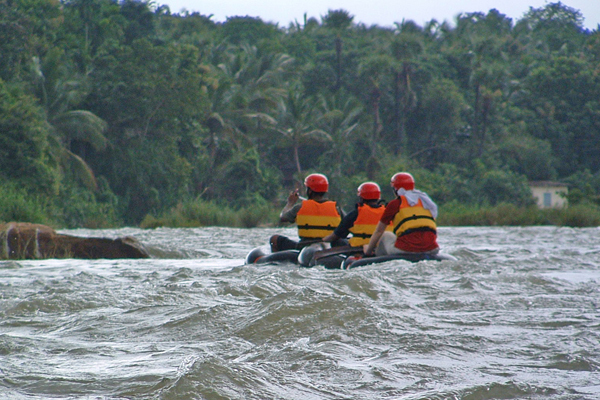 You can also choose to spend an entire day trekking and rafting on bamboo rafts along the scenic Periyar Lake. A day like this offers a good chance of spotting wildlife in close quarters. 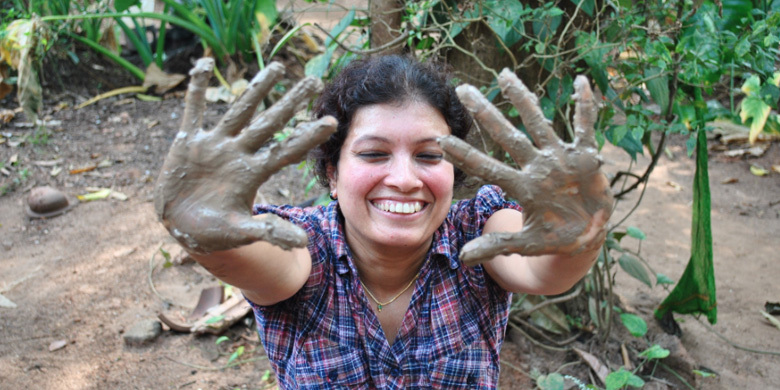 In Periyar and Chimmony, the nature driven experiences are operated by members of the local community belonging to the Eco Development Committees (EDCs). The benefits are transferred directly to the community members. Trekking assistants and guides were mostly poachers and the entire program in Periyar was designed to rehabilitate them. All parts of our trek routes and campsites follow zero waste management. During and after every trek, we collect and dispose plastic waste that might have been left behind by other tourists and local people. The idyllic backwaters of Kumarakom are about 10kms from Kottayam and are considered the most beautiful backwater stretch in Kerala. Here you can wind down and relax at a backwater resort in Kumarakom. Visit the harbor city of Alleppey and check into a luxurious houseboat for a leisurely overnight backwater cruise. Enjoy the dining experience on board and watch as time slows down to a crawl against the idyllic backdrop of the backwaters. The houseboat drops you at Alleppey and then you transfer to a beach resort in Marari (45-minutes) for relaxing moments of leisure. Please note the above is a sample itinerary for a 12 -14 days trip to Kerala. We design each trip according to your personal calendar, wishes & needs. The Classic Kerala Tour is a classic for a reason – it covers most of Kerala’s limitless magic, without rushing through its many wonders. Kerala is home to some stunning bio-diversity. It’s many forest reserves are home to countless species of mammals & birds, including many endangered species. Connect with nature’s plentiful bounty through our ‘Tiger By The River’ tour, as we take you through bend after bend of unparalleled natural beauty! In the North you will visit the beautiful coastal city of Calicut and travel to Wayanad by road (3 hours) with one of our storytellers. On the way you might want to visit Edakkal caves and its pictorial remnants of civilisation dating back to 5,000 BC. Enjoy the adrenaline rush of a wildlife safari in Muthanga wildlife sanctuary, a biodiversity hotspot in Wayanad. The 24-kilometre safari is a chance to spot the Asian elephants, bears, wild gaurs (bison), spotted and sambar deers or even a leopard. After a lunch in a local home, we take you on a Spice Tour, tea trail and finally cool off at a waterfall in the middle of a rainforest. Traditionally, Kerala is a major exporter of spice. Several communities have been engaged in the cultivation & plantation of spices since centuries. The Spice tours were started with the objective to support small farmers and spice planters in and around Wayanad as an alternative, supplementary source of income. The tour provides a glimpse into the lives with special focus on the struggles of spice farmers against fluctuating prices and globalisation. Trek up the magnificent Chembra Peak, the highest point in Northern Kerala. The peak is in the midst of high-altitude shola grasslands and offers panoramic views all round. It’s a moderately tough trek at about four hours, with the chance of spotting wildlife in the early hours. After descending we rest for the day at a boutique hotel/homestay. From Waynad you will travel to Silent Valley (3 hours), one of the world’s most treasured biodiversity hotspots, and set up a camp at a property near the jungle. On the next day we will travel uphill by jeep to reach the Sairandhri Forest Camp. Silent valley has one of the largest viable breeding populations of lion tailed macaques, a true arboreal monkey - a highly endangered species and a good population of birds, butterflies and orchids. 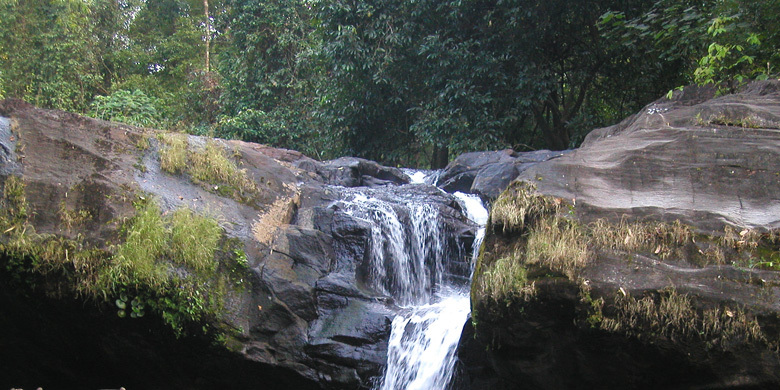 A small trek will lead you through the rainforest to Kunthipuzha, which flows through the valley. 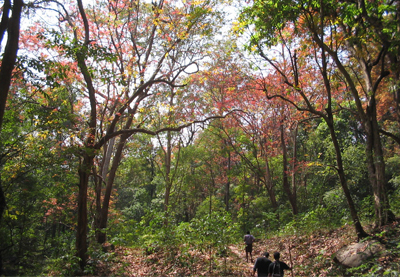 Our naturalist will lead you on a light trek through the wilderness, which comprises of tropical evergreen and deciduous forests. The day ends camping under the starlit sky by the rainforest. Drive on to Thattekad Bird Sanctuary (2 hours), a paradise to observe birds. Ornithologists have identified more than 253 species of birds in the 25.16 sq km area. Here you will stay overnight in a forest camp. Munnar is a breathtakingly beautiful hill station known for its misty col climate, tea plantations and forests. Enjoy the sense of space while you stroll through the tea plantations, or just sit back, and unwind as you switch-off, sip on some exotic tea & watch the world pass you by – trust us, it’s worth it. A 2 h drive from Munnar will take you to Chinnar Wildlife Sancturary and trek upwards through the jungle to Vysapara Hills, which is an excellent spot for spotting wildlife. We camp overnight in a jungle hut. The next morning we continue to trek and follow a river. The forest’s vegetation, dry & deciduous, makes it easy to spot wildlife while on foot. The terrain will be undulating with rocky patches that add to the scenery. From Chinner the journey goes on to Periyar (5.5 hours) where we catch the night patrol at dusk. The naturalist will take you to observe and listen to the jungle in the dark, guided by torchlight. Next day, trek during the day and use bamboo rafts to navigate Periyar lake. 63 species of mammals have been recorded in this protected area, along with 323 species of birds. All the species endemic to the Western Ghats except the Nilgiri Laughing Thrush are found here. Out of the 119 species of butterflies recorded, 20 are Western ghat are endemic. From Periyar we move base to Vallakkadavu Camp (2 hours). 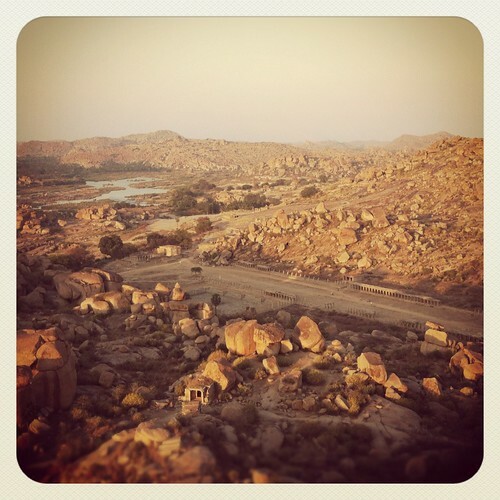 We go for a short trek around the camp and stay overnight in tents. One of the most unique eco-tourism programs in India, this program supports people who live on the fringes of the forests as trackers, guides and interpreters. 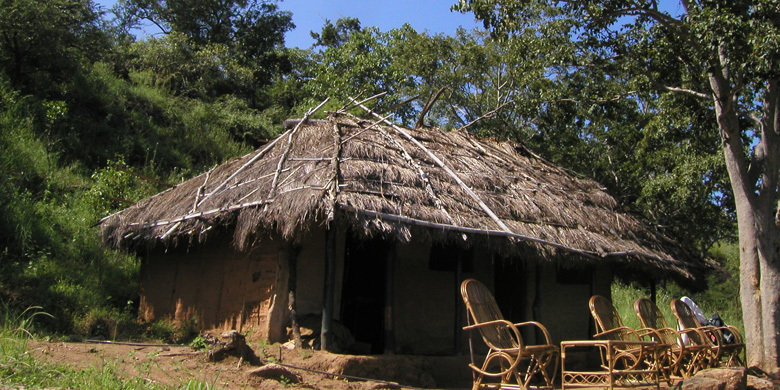 Due to several ‘social re-engineering’ and political decisions, many of the tribal people have been forced to leave the forest and are no longer associated with it in their day-to-day activities. This particular trip focuses on their role as care takers of the forest, its resources and wildlife, and by doing so also assures them a decent livelihood with dignity. Sustainable income through responsible tourism ensures increasing interest amongst local community members, which in turn supports conservation of wildlife and forest resources. Poaching, forest fires and brewing illicit liquor in forest areas have been reported by our assistants and trackers. The authorities have successfully handled these activities with support from VSS (Forest Protection Committee) and EDCs (Eco Development Committee). Except in the rare case of communication problems in terms of naturalist’s interpretation, all the associates in this program are locals. The now famous ‘Periyar Model’ has successfully rehabilitated several former poachers as protectors. The majority of the accommodation used in this itinerary is operated by local community members belonging to the Eco Development Committees (EDCs) and supported by our team of naturalists and professionals. The benefits are transferred directly to the community members and are not token gestures. Kerala is home to some stunning bio-diversity. It’s many forest reserves are home to countless species of mammals & birds, inculding many endangered species. 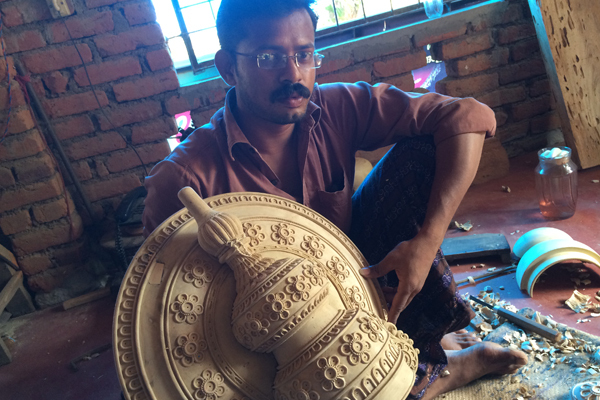 Along the banks of River Nila in Kerala, thrived many forms of art in the years gone by! 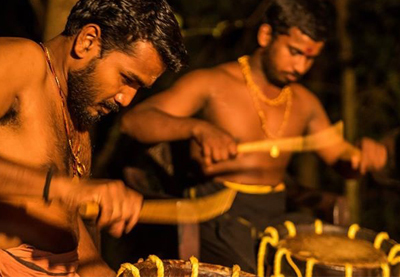 One such incredible art-form is the enchanting percussion-based music; traditionally restricted to be performed within the confines of the temple sanctum sanctorum, find out the story of how one inspirational proponent of this art took the music to the masses. Follow the gradual decline of the art in the aftermath of his demise and revel in the struggle of his son to protect, document and nurture this precious heirloom of centuries. Our Musical Trails are built with the objective to bring to travelers an authentic, rare piece of art that goes centuries back in time. The local community of students at the music school in Mulayankaavu will provide an introduction to the history and nature of their music, followed by a wondrous performance to cap off a magical evening! 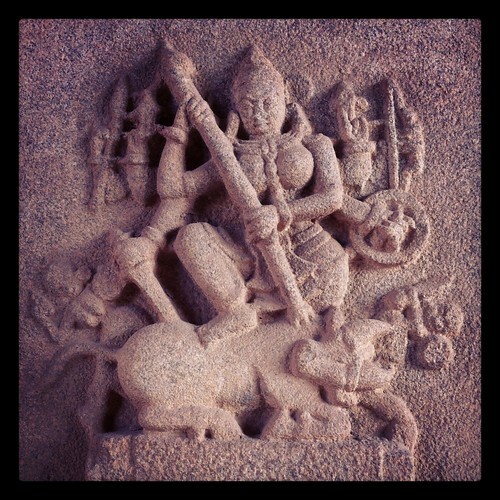 Along the banks of River Nila in Kerala, thrived many forms of art in the years gone-by! One such incredible art-form is the enchanting percussion-based music. Kerala’s folklore, like its landscapes, is immense, vibrant and extremely colorful. As amazing as it sounds, such variety also presents a graver challenge over time – as civilizations mature and develop, countless art forms are lost or forgotten. The Blue Yonder worked with a local group of folk artists to create a platform for the restoration, preservation and conservation of folk arts. This wonderful group traveled across countless villages to document art forms from older generations and created one of the largest digital archives of folk music and local knowledge. Folk Expressions presents an opportunity for travelers to interact with this wonderful group of folk artists and also witness the fruits of a brilliant project aimed at conserving priceless folklore and art forms! 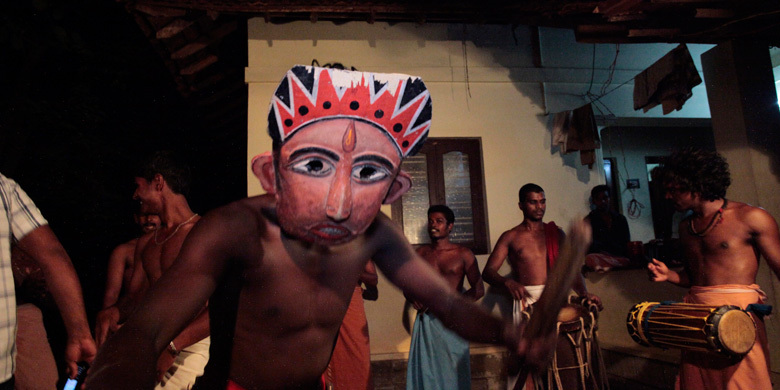 Kerala’s folklore, like its landscapes is immense, vibrant and extremely colorful. The communities spread along the banks of River Nila are anything but shy when it comes to skilled handiwork and craftsmanship! Be it pottery, handlooms, weaving, or bell-metal craftsmanship, the skill of these communities in unparalleled. Through our visits to the pottery, handicrafts and bell-metal workshops, we will present travelers a rare once-in-a-lifetime opportunity to engage in interactive sessions with some of the most skilled artisans of these lands. Travelers will also have the option of rubbing shoulders with these artisans and trying their hand with clay on the ever-rotating wheel! Our visits to these workshops is an acknowledgemenet of the efforts to rehabilitate and preserve the age-old craftsmanship of these villages. Our visits expand knowledge about the program and provide them financial support. The communities spread along the banks of River Nila are anything but shy when it comes to skilled handiwork and craftsmanship! The dynamics of River Nila are complex and precarious. A vibrant and thriving bunch of communities flourished around its banks for centuries. Yet, the strain of fast-changing economics and lack of sustainable sources of income was threatening to ruin the fine balance between nature and humans in this wonderful ecosystem. 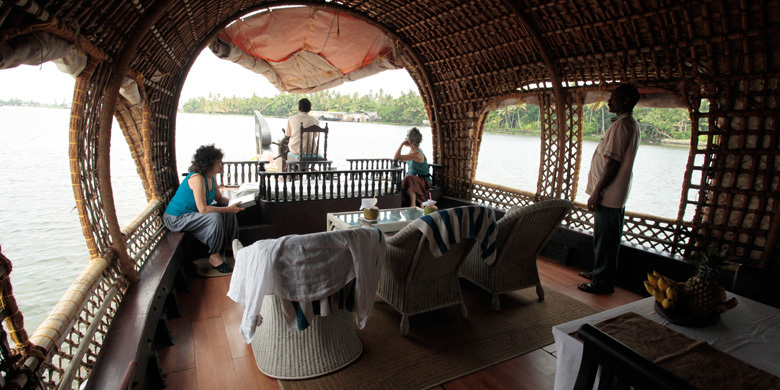 The Kerala River Cruises on Nila are held on-board the local ‘thoni’ boats. They are guided by oarsmen from the local communities. These cruises act as a source of alternative, supplementary source of income for these people. Many of the oarsmen were otherwise engaged in disruptive practices such as mining sand illegally from the river bed for lack of income sources. 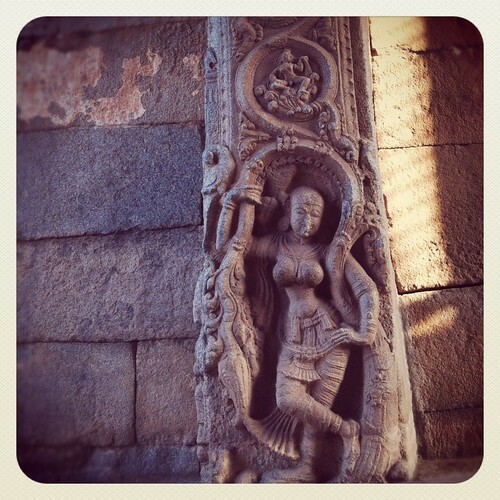 Join us on a cruise aboard the Thoni, in the company of these natural storytellers. Meander along the course of this beautiful river and look at life in the villages along its bank from a distance! The dynamics of River Nila are complex and precarious. A vibrant & thriving bunch of communities flourished around its banks for centuries. The Kerala Legends Trails is a trip down the rich history of Kerala which goes back several centuries; naturally, its bounty of stories, legends and civilizations is wholesome and plentiful. Our skilled storytellers and interpreters will introduce you to stories that talk about the River Nila civilisation as we travel through historical places. 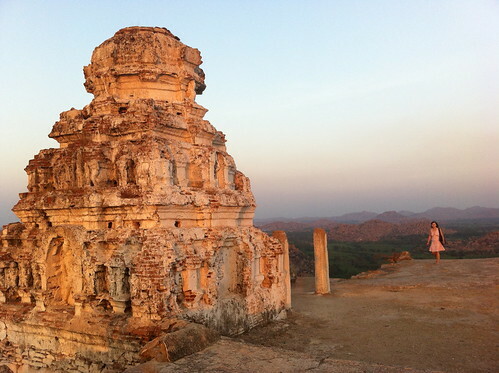 Become acquainted with the strong connection between the Nila and Buddhism! Learn about Mamangam – a festival celebrated once in 12 years by the ancient kings of Kerala to choose an Emperor; discover the rich diversity of faiths in Kerala and spend a tranquil moment at the spot where German missionary Dr. Hermann Gundert wrote the Malyalam-English dictionary. 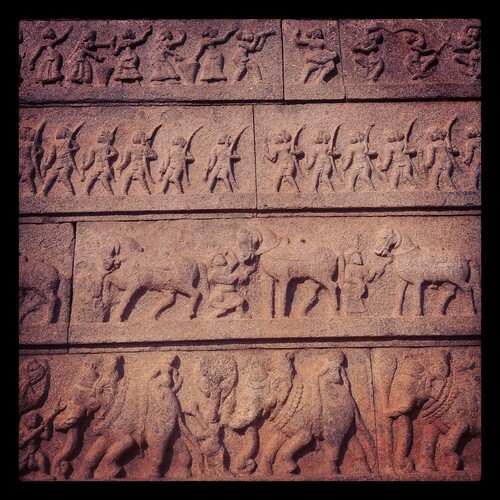 The Kerala Legend Trails is a spectacular journey through time, uncovering secrets of Kerala’s rich history! The rich history of Kerala goes back several centuries; naturally, its bounty of stories, legends and civilzations is wholesome and plentiful. In a remote village not far from Fort Kochin, we came across an ancient community struggling to sustain a rare, organic cultivation of a special crop. 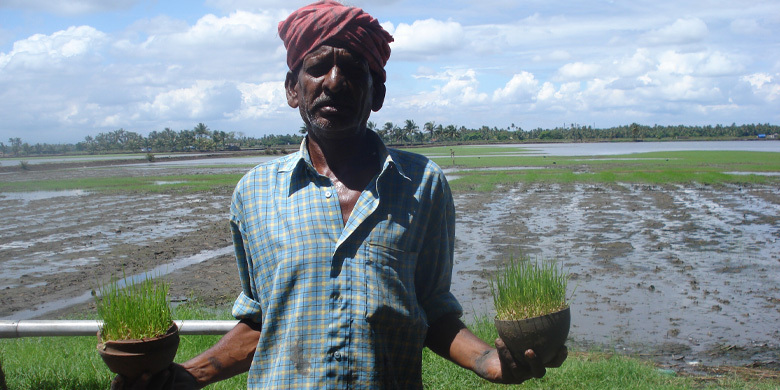 Pokkali is one of the oldest and only salt-tolerant varieties of rice that grows organically. 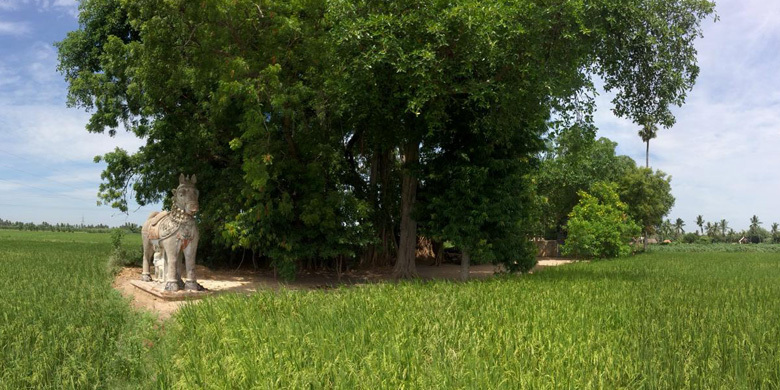 Though the communities from these areas have been cultivating Pokkali for centuries, a combination of factors threatened to push the crop to the verge of extinction. The Blue Yonder worked in consultation with the agrarian community to build a sustainable model to facilitate the preservation of this rare crop! How did we do it? What part did the farmers play? Who were the other vital stakeholders? All of these questions and many more will be answered through our Pokkali and Organic Farm visits! Pokkali and Organic Farm Visits are designed to bring the story of Pokkali to travellers! 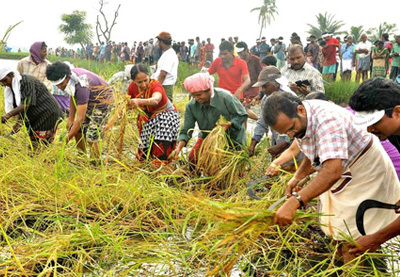 It’s unique qualities, cultivation, its deep-rooted connection with the community and their struggle to sustain it presents a wonderful case in how various stakeholders from of society collaborated to preserve the delicate cycle of nature! In a remote village not far from Fort Kochin, we came across an ancient community struggling to sustain a rare, organic cultivation of a special crop! Pokkali is one of the oldest. 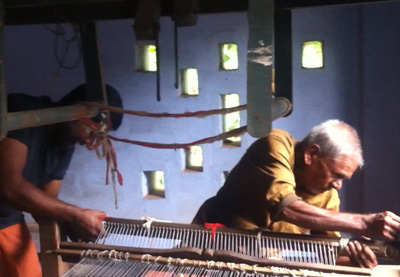 The Handloom industry in Kerala is a work of art in itself! 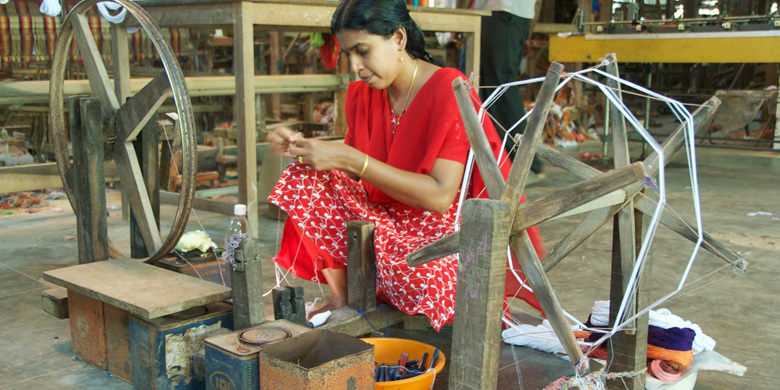 Fine weaving and handspun cotton have been the landmarks of Chennamangalam for years. 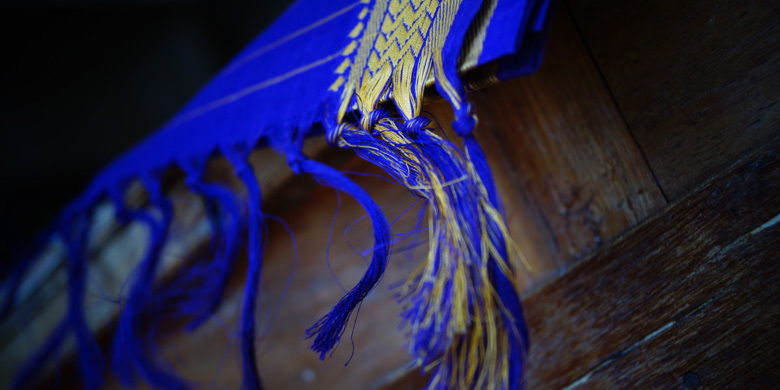 Named after its village of origin, Chennamangalam handloom is renowned for its quality. Kerala Saris that are symbolic of Kerala’s culture and traditions are the highlight product of this handloom industry. The weaving is done in a distinct style, with special treatment to the thread, using a special paste, which makes the fabric strong and long lasting. While the distinct style of these saris is renowned all over Kerala, only artificial dyes are used to make them. The Blue Yonder introduced and facilitated the use of natural dyes to local weavers in a co-operative society. Follow our footsteps to learn more about the wonderful history of this traditional industry, hear their story in their own voice, and unearth the hidden secrets of their trade. The Handloom industry in Kerala is a work of art in itself! Fine weaving & handspun cotton are the landmarks of Chennamangalam for years. After the harvest of the summer crop, villagers congregate to the local temple on an appointed day. What follows is a breathtaking rendition of ritualistic dance-drama based on the mythological tale of a battle between the Goddess Kali (of death and destruction) and the demon Darika. 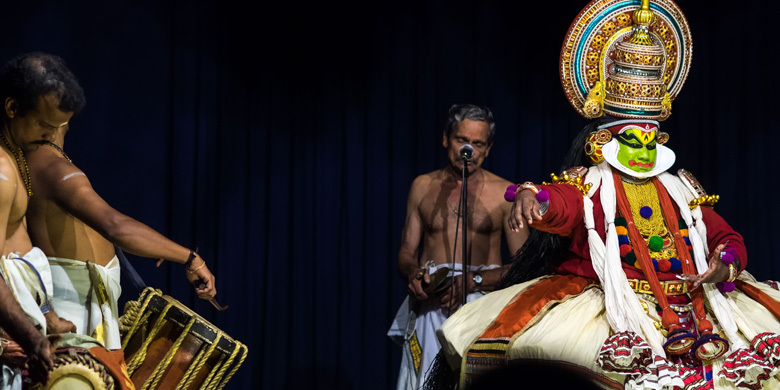 Known as the Mudiyettu, this ancient ritual is a dynamic art form, performed using vivid colors, percussion and deep baritones. 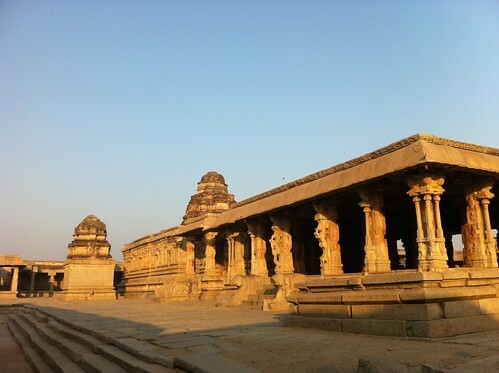 The Mudiyettu serves as an important cultural site for transmission of traditional values, ethics, moral codes and aesthetic norms of the community, to the next generation, thereby ensuring its continuity and relevance in present times. 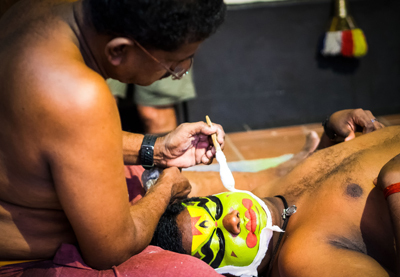 The Mudiyettu, declared as an Intangible Heritage of Humanity by UNESCO, is slowly slipping into oblivion. 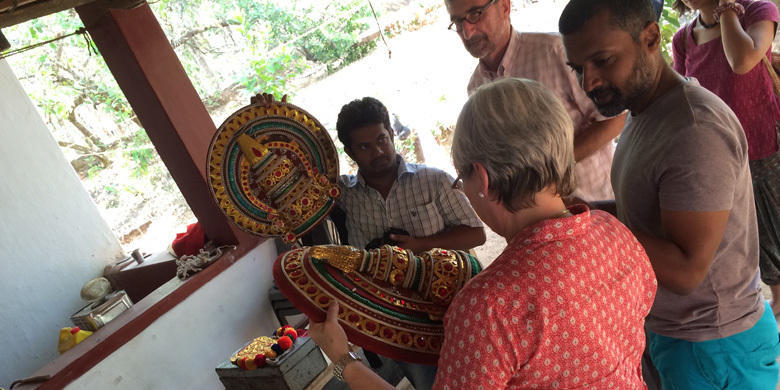 The Kerala Craft and Ritual Trail take travellers deep into local communities and introduce them to countless such rituals and crafts! These trails also help us provide the communities with the resources required to preserve age-old rituals and generate a sense of pride and ownership amongst them.